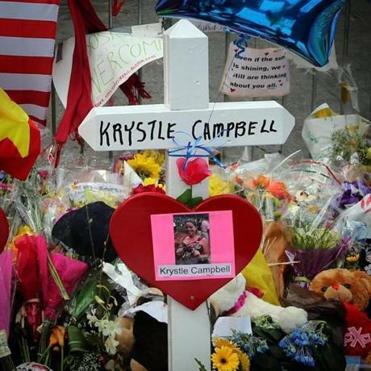 A memorial cross for Krystle Campbell on Boylston Street three blocks from the finish line. It’s gotten to the point that every afternoon, when it turns 2:50, Stephen Segatore doesn’t even have to look at his watch. On Monday afternoon, when the clock struck 2:50, Segatore was standing in the narrow aisle of a bus parked on Berkeley Street, near the corner of St. James, taking care of a young woman who had just finished the Marathon. The woman was wrapped in one of those silver capes the Boston Athletic Association gives each runner at the finish line. She was shivering — shaking, really. He gave her a blanket, some broth, some kind words. Still, there was something about this young woman that was slightly unnerving. Two years ago, Segatore, a registered nurse at Tufts Medical Center, was outside the medical tent opposite the Boston Public Library when a badly wounded Krystle Campbell was carried toward him and Dr. Mitch Lunn from Brigham and Women’s Hospital on a stretcher. Segatore saw that she was burned, that she appeared to have broken bones. Joined by an emergency medical technician from Boston EMS, Segatore and Lunn performed CPR and ventilated her with a bag mask. The EMT put her on a cardiac monitor and they saw she had a heart rhythm but no pulse. It’s a condition called pulseless electrical activity, or PEA. After a few minutes, a supervising physician told them to stop working on 29-year-old Krystle Campbell. “We held her hands,” Segatore said. For the last two years, Segatore has second-guessed himself. He wondered whether he could have done more to save Krystle. He wondered this because, in a hospital setting, PEA is usually not fatal. But then, last month, the medical examiner who performed the autopsy on Krystle Campbell climbed into the witness stand in federal court where one of the two brothers who murdered her and Lingzi Lu and Martin Richard at the 2013 Marathon is on trial. The doctor described in gruesome detail the damage the bomb that had exploded outside Marathon Sports had done to Krystle Campbell. Segatore and the others who tried to save her could see the external damage to her body, but not the internal damage that killed her. There have been some people who have questioned the wisdom of having a trial at all, of reliving the trauma of that horrible day, of outlining in agonizing detail the damage that was done to bodies on Boylston Street two years ago. But in Stephen Segatore’s case, that agonizing detail freed him from a gnawing agony he had carried privately for two years, an unrelenting sense of regret that he could have done more. When he read the testimony of the medical examiner, he knew he and Mitch Lunn and that EMT had done everything they could to save Krystle Campbell. We are what we carry in this life, and Stephen Segatore carries an unshakable belief that when she died, Krystle Campbell was not suffering, that she was surrounded by strangers who treated her like a sister, like a friend, who spoke comforting words to her, who held her hands. As the afternoon wore on, the rain stung and an unforgiving wind raced down Berkeley Street, from the South End to Back Bay, whipping the runners as they turned off Boylston. 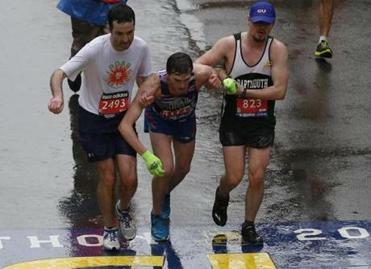 Stephen Segatore climbed back onto the bus, where runners shivered, and he was needed.